The theater scene in San Francisco is vibrant and experimental. Home to some of the oldest theater companies, San Francisco has inspired many a pioneering and experimental theater expression. The Center Rep on Civic Drive is a popular spot for theaters and parties, what with its chic shops, exotic restaurants and magnificent theater ambience. Aurora Theater is run by Barbara Oliver and Tom Ross and is host to classics as well as modern pieces. Along with the Berkeley Repertory, the Aurora Theater in San Francisco offers an intimate space for about 150 persons. The Berkeley Repertory Theatre or 'Rep' is at the top of most theatergoers' lists. American Conservatory Theatre (A.C.T.) is San Francisco's flagship theater and boasts a national reputation. Despite expensive seats and difficult parking, this theater in San Francisco has an impressive ambience. The Yerba Buena Center for the Arts Theatre is located in the Metreon Complex and hosts performances ranging from modern dancers and neo-classical performances to other performing arts. Theatre Rhinoceros - One of the West Coast's premiere gay theaters, this theater seats 117. 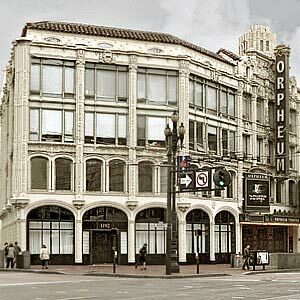 The Orpheum theater in San Francisco dates back to the late nineteenth century and was designed by Fisher and Lawrie. It seated around 800 persons and was primarily a vaudeville theater. Over time it became predominantly a movie house. In the summer of 2002, the Orpheum Theater underwent a renovation at a cost of $10 million. The refurbished Orpheum Theater boasts of mirrored walls, hand-carved and gilded consoles. With high back armchairs and gold and silver brocade on the walls, the San Francisco Orpheum Theater is home to many a successful Broadway shows. There are larger seats with more legroom and improved stage views. The theater now has additional restrooms; mechanical system upgrades and has seen many a backstage improvement.